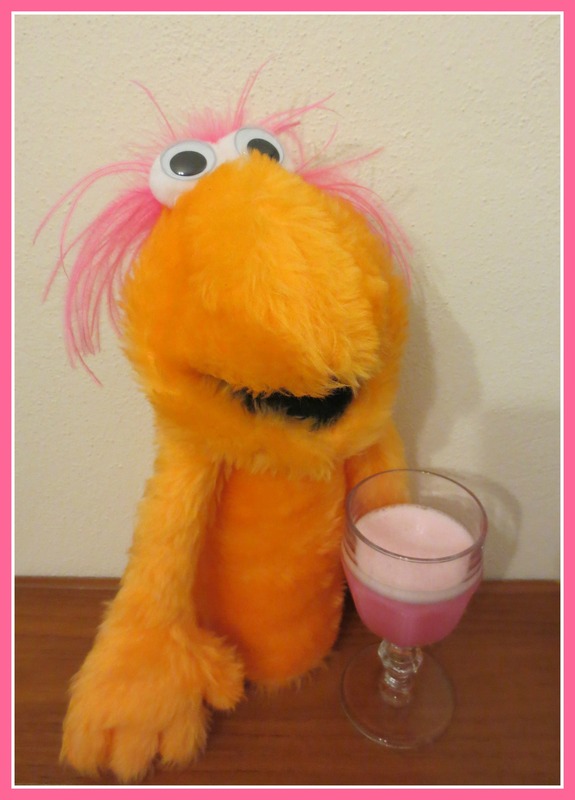 The Clover Club is a classic old cocktail that’s recently been reappearing on menus and in cocktail books, although I bet it’s never made an appearance with Blackie the orange puppet (pictured above, in case you missed it) until now. Having never tried one before, I decided to make one at home and consulted The Architecture of the Cocktail (Amy Zavatto, Harper Collins, 2013) for a recipe. Zavatto’s snappy prose is a pleasure to read, her recipes are clear and there are no photos in her book, so you have no expectations of what your creation should look like. On the plus side, this forces you to make a drink because it sounds tasty, not because it looks pretty. On the minus side, it means you have no warning as to just how pink a Clover Club can be. When I mixed the drink, I used a good-quality raspberry cordial (by which I mean one targeted at adults, not kids, although they are probably the same thing in two different bottles) instead of the required raspberry syrup because that’s what was readily available. (I’d have made my own raspberry syrup except (a) fresh raspberries were unavailable, (b) there was a product recall on frozen berries at the time, as they were giving people Hep A, and (c) I was feeling lazy.) And I was instantly horrified by its shocking shade of pink. Zavatto had said it was pink and “blushed in hue” but she hadn’t mentioned it looked like a liquidised musk stick crossed with Molly Ringwald’s prom dress in Pretty in Pink. 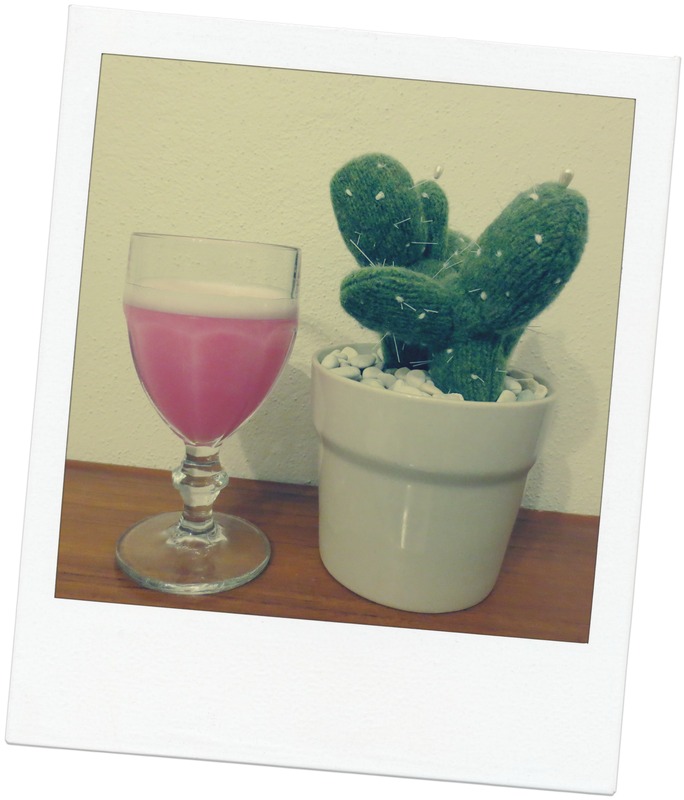 Even next to the brightest thing I could find – Blackie – the Clover Club was still a shade of fluoro pink that said “don’t drink me, I’m a strawberry milkshake that’s been to Chernobyl”. And so there was only one thing I could do: a bad ’80s-style photo shoot. Here we have the drink on a slightly awkward angle, complemented by a hideously ugly green frame. And here’s the Clover Club making a wacky appearance with the knitted cactus it just wed in Vegas. Oh, how delightfully quirky! Eventually, the CTO (Cocktail Tasting Officer) and I plucked up the courage to try the gin-based cocktail…and it wasn’t bad. It looks sickeningly sweet, like something a five-year-old might consume at a carnival, but it’s a dry, sophisticated drink. The CTO approved heartily, though I found it too dry for my liking. To me it tasted like something someone with no sense of humour would drink, and would pronounce ‘pleasant’. Perhaps if I made it with a more floral/less dry gin – and raspberry syrup, not cordial – I’d like it better. Anyway, if you’d like to try one, here’s the recipe. Half-fill a cocktail shaker with ice. Add all ingredients and shake until well-chilled. Don your sunnies and strain slowly into a cocktail glass. The Clover Club is much harder to look at than it is to make. 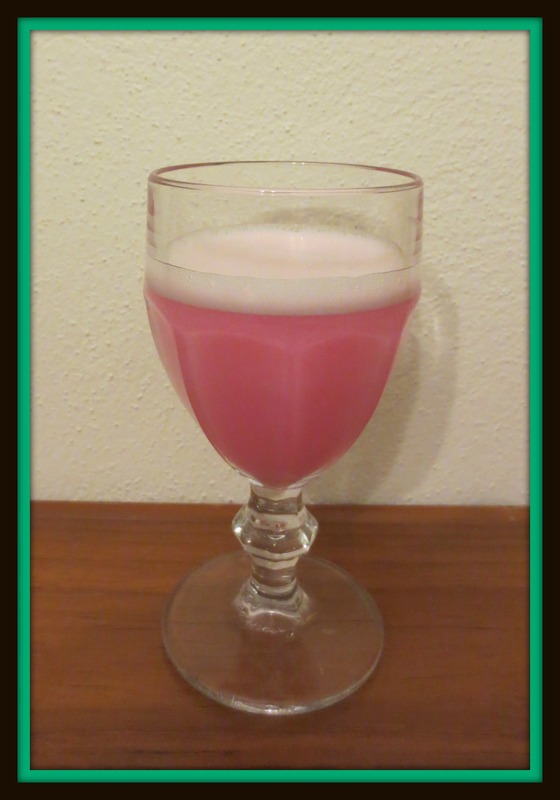 This version of the Clover Club appears in The Architecture of the Cocktail (Amy Zavatto, Harper Collins, 2013). Hey! I gave you that cactus! Well hello there Sweet Danger! I’ve kept it alive in the hope I can one day milk a yarn about tequila from its woolly veins.